Very nice dinner yesterday night, no complaints, animated conversations.... sigh... it can be done! Prepare ramekins by rubbing the insides with the garlic, butter them using a brush. 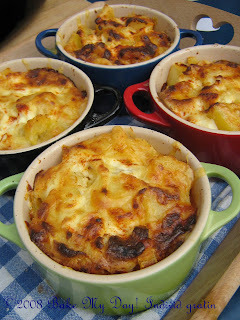 Fill ramekins with cooked and thinly sliced potatoes to halfway up. Divide blanched leek over the 5 ramekins, season with a sprinkling of salt, pepper and nutmeg. Proceed with sliced potatoes almost to the top. Pour some melted butter over the potatoes. 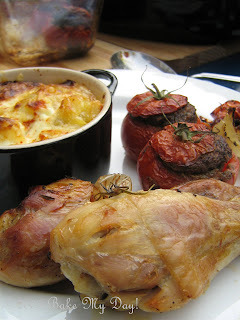 Top each ramekin with a tablespoon of parmesan and a tablespoon of the other cheese. Again season lightly with salt and pepper, add a dollop of creme fraiche and sprinkle with sweet paprika powder. 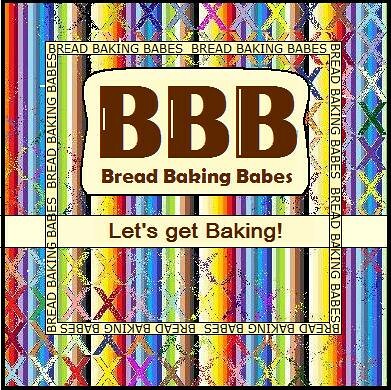 Bake in a preheated oven 200 C for approx. 2o minutes, until the tops are nice and golden brown. Simple, easy preparing (store in fridge until ready to cook) and...everyone has their own share of golden crust which can be very important! Coming up soon: the stuffed tomatoes. Oh so good Karen!! I need one or two of those! Individual small servings are so much fun - you get to try so many more things that way. I love it.